Spider-Man: Homecoming may be the current cover star of Empire, but there’s plenty more content to be found within the pages of the magazine’s latest issue. 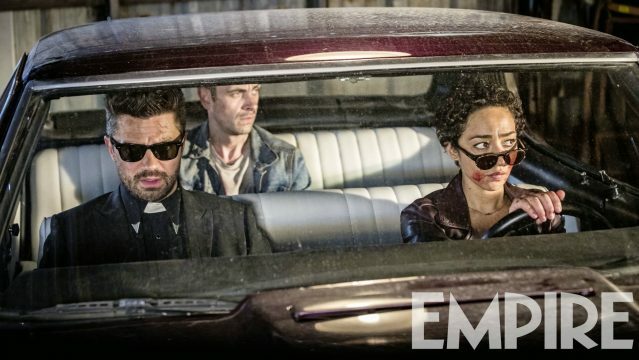 Case in point: today’s all-new action shot for Preacher season 2, which places Jesse Custer (Dominic Cooper), Tulip O’Hare (Ruth Negga) and Cassidy (Joseph Gilgun) behind the wheel as they set off on a road trip to find God. Set to premiere via AMC late next month, the second season will purportedly feature a radically different tone than the first. As part of Empire’s report from the New Orleans set, the outlet quizzed lead star Dominic Cooper about Preacher‘s second season, which seemingly won’t spend too much time pandering to new viewers. It feels like we’re working on a different show. We’re playing the same characters, but the tone has changed dramatically. Initially, it was a stationary show where we needed people who hadn’t read the comics to invest into these characters. Now that we are on the move, it is tonally going to feel like a change. With only a handful of teasers currently populating the Internet for Preacher season 2, it’s difficult to gauge how that new tone will pan out across the course of 13 episodes – up from the original run of 10 installments – but at the very least, fans of Garth Ennis and Steve Dillon’s jet-black comic book series can look forward to delving a little deeper into the backstory of Jesse Custer and his eccentric allies. Speaking of which, it’s been confirmed that Graham McTavish is back as The Cowboy (AKA The Saint of Killers), while AMC has so far recruited Noah Taylor, Pip Torrens, Julie Ann Emery (Better Call Saul) Malcolm Barrett, Ronald Guttman, and Justin Prentice for season 2. Comprised of 13 episodes in total, Preacher returns for a second season on June 25th. But will you be tuning in?